In the quest for sonic perfection, manufacturers are continually trying to find new ways to better isolate critical circuits from vibrations. 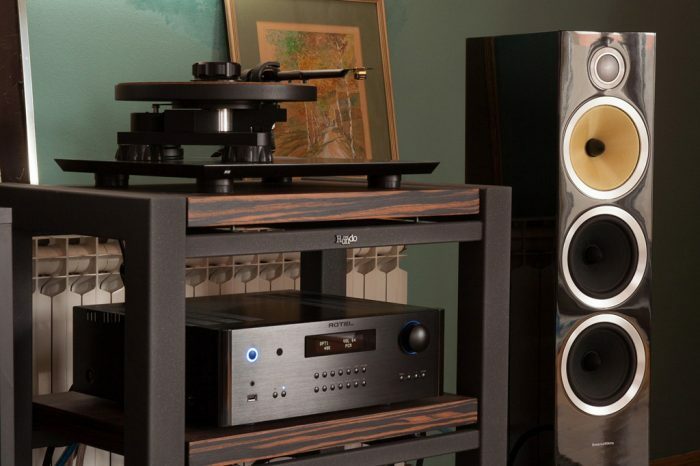 What is further of great importance to us is that the whole composition of the rack loaded with audio components must not be visually too abrasive in the living or listening room. 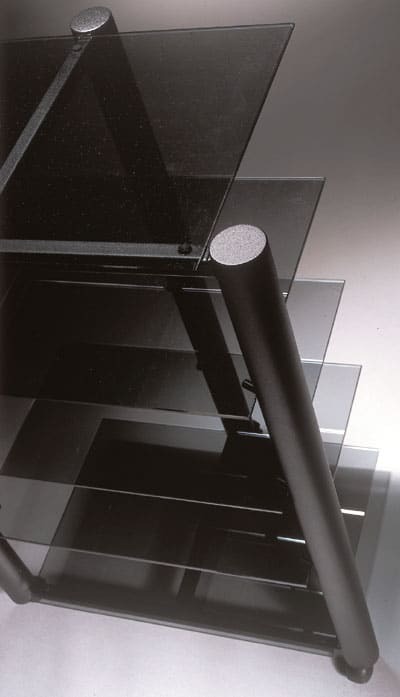 It must not in any way attract too much attention to itself due to questionable design feature, or unnecessary demonstration of the latest technological capability in the processing of materials or surfaces that inevitably transfer high cost of manufacturing to the buyer. 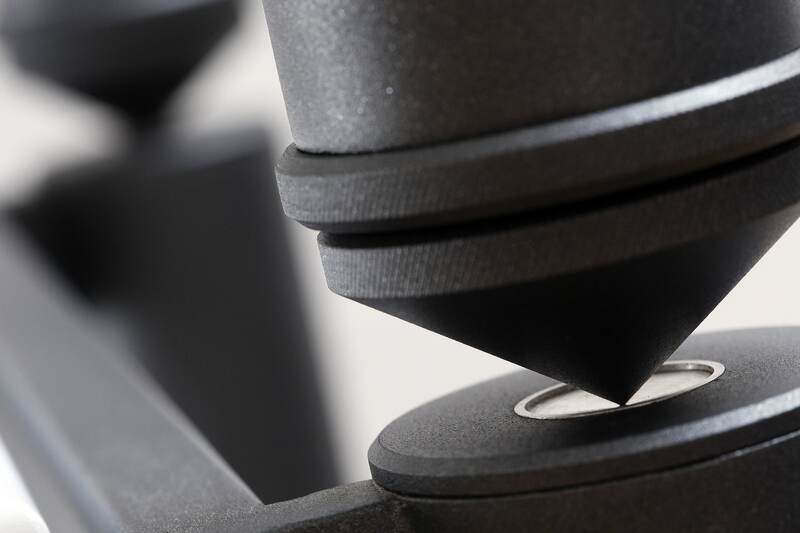 We found that by adding mass and carefully chosen damping material, with addition to fully welded thin walled steel tube construction, we can obtain excellent results. 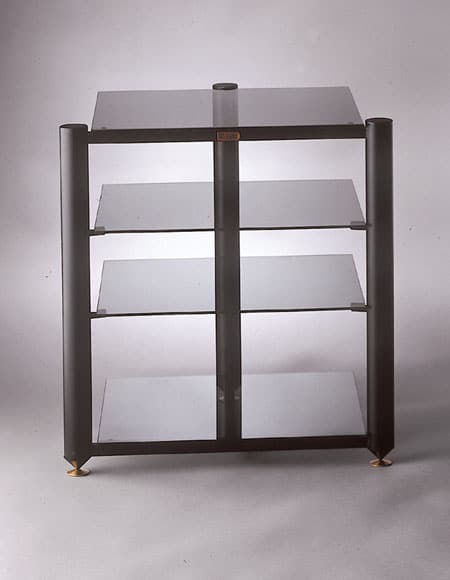 Further, by choosing the color of the steel frame as well as the real wood veneer or painted surface of the shelves, the rack will blend in the living room and add to the whole experience of living in that space. 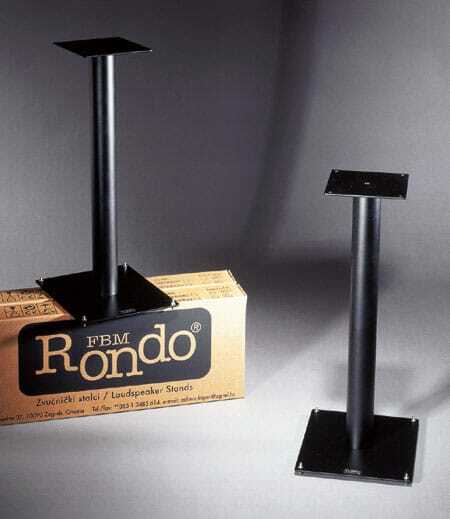 These same principals hold true for loudspeaker stands. Panel resonance, if not properly damped, will be radiated with the music. This results in the hardening of upper frequencies and distortion of tonal accuracy. In the lower frequencies these resonance’s impair transience, making base notes sound muddy and give the impression of a limited dynamic range. 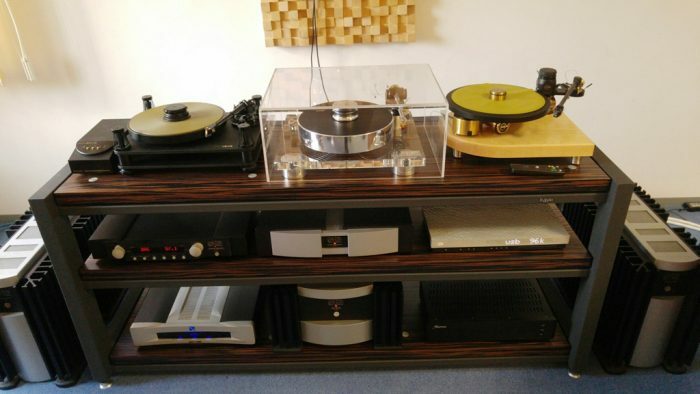 FBM RONDO was founded over 25 years ago by Želimir Frigan, an avid audiophile in Zagreb, Croatia. During that time a vast experience was accumulated with regard to the vibrations, resonances and other harmful influences which occur during audio playback. 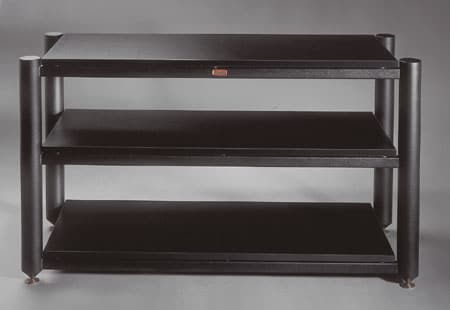 We have recently found a new way to make the production of audio racks and stands exciting again to us as a manufacturer, and for you. We are able to offer and create exactly what is needed after agreement with an individual customer about the dimensions, color choices and finishes both on metal frames and on the shelves. 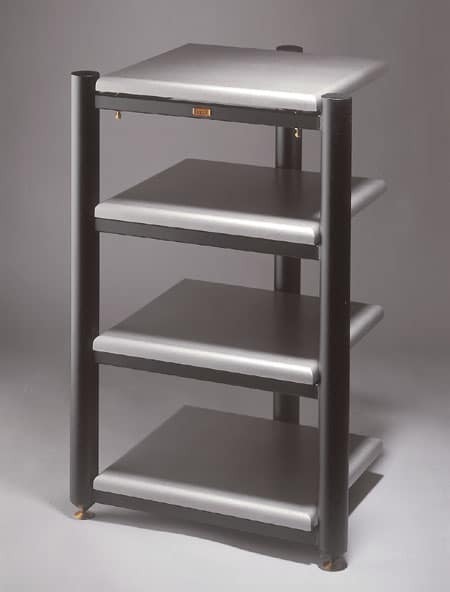 With the help of our distributors who are fully acquainted with all the options we are able to offer, every customer will quickly design his own rack, which we will enjoy making according to his needs within a reasonable time. When dealing with electrical pulses as tenuous as those found in DAC modules and pre-amplifiers, even the slightest mechanical instabilities will cause audible distortions. By taking measures to ensure that vibrations are kept away from signal carrying circuits, distortions can be held to inaudible levels. This same reasoning can be applied to the equipment support. 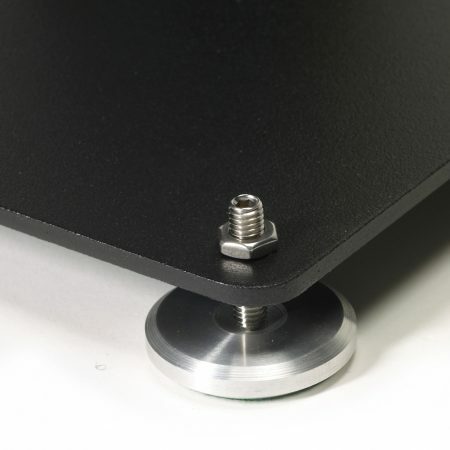 A competent design will isolate your component from the reaches of destructive mechanical forces, thus completely eliminating the risk of vibrations from ever affecting your audio circuits. When considering tube electronics, the need for proper isolation becomes much more critical. These circuits exhibit micro-phonic behavior amplifying the noise and sending it through your audio chain. Panel resonance, if not properly damped, will be radiated with the music. This results in the hardening of upper frequencies and distortion of tonal accuracy. In the lower frequencies these resonance’s impair transience, making base notes sound muddy and give the impression of a limited dynamic range. Vibrations also affect crossover components. Symptoms may include, blurring of spatial resolution, inability to resolve subtle nuances, and difficulty with the rendering of micro dynamics. 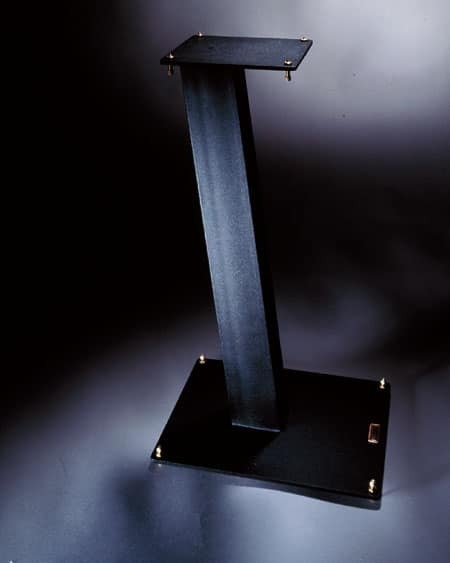 Finally, an equipment or loudspeaker stand should not call attention to itself, thanks to some obscure yet questionable design feature. It should look at home in any decor while exhibiting a subtle sense of ingenuity and practicality. 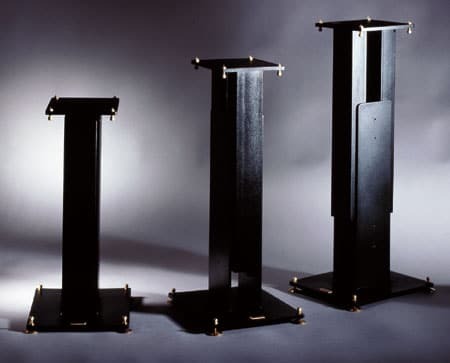 HOW DO SPEAKER STANDS, SPIKES AND DAMPERS WORK? 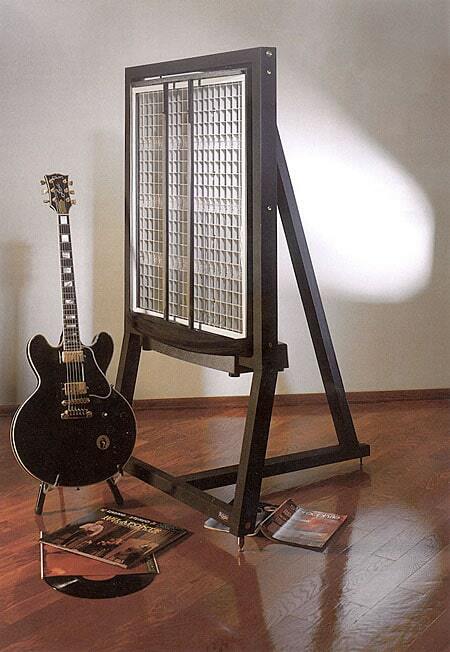 The goal of an speaker stand is to hold the speaker cabinet perfectly still relative to the free moving speaker voicecoil/cone assembly, which ensures that most of the electrical energy (musical signal) imported into the voicecoil is converted into acoustic energy (some will always be converted to heat). If the speaker cabinet is free to move, some of the electrical energy will go into moving the cabinet instead of the cone. When this happens, the musical signal becomes distorted since portions of it are waggling the cabinet around instead of driving the loudspeaker cone. Spikes and Blutack work in slightly different ways to achieve the same goal. 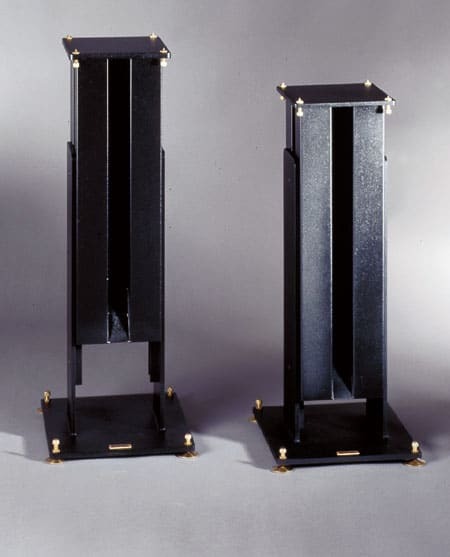 Bluetack couples the speaker to the mass of the stand, making it too heavy for the speaker motor assembly (voicecoil) to move for all signal frequencies and amplitudes, there is less resistance in moving the speaker cone + air than there is in moving the cabinet + stand. This is why adding mass to a speaker cabinet and/or stand improves the quality of the acoustic signal we hear. 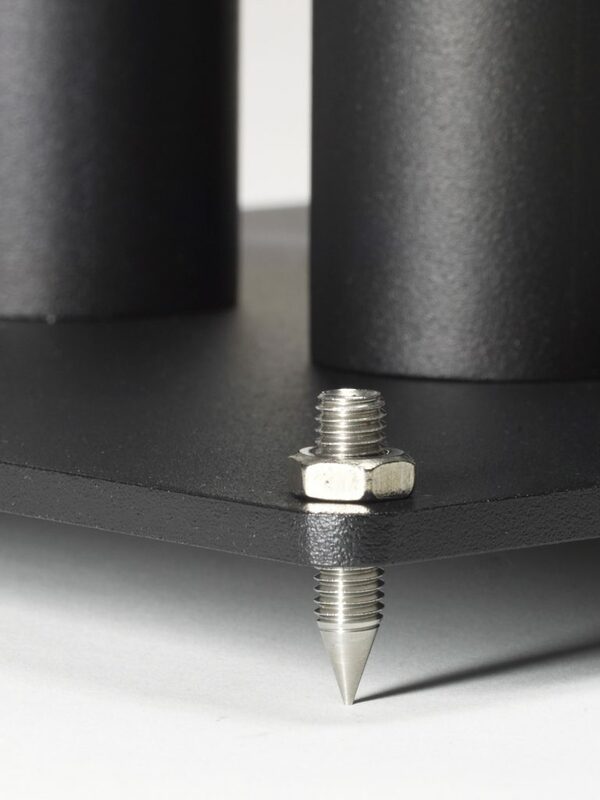 Spikes on the other hand effectively reduce the contact area of the speaker relative to its mass, making it far more difficult to move. To use a real life example, imagine you are pushing a 100kg box across a shiny flat floor. Hard to move. Now place the same box on 4 small nails sticking up from the same floor. Impossible to move. Why? Because the contact area has been reduced from say 0,25m2 to 0,00000025m2. In the first instance, the box is excerting a force of 4.000N/m2 onto its contact area. On the nails, the box in excerting a force of 4.000.000.000N/m2 onto its contact area. Again, from the music signal’s point of view, the effect is to make the cabinet appear to be a much heavier load to move compared to the speaker cone + air. 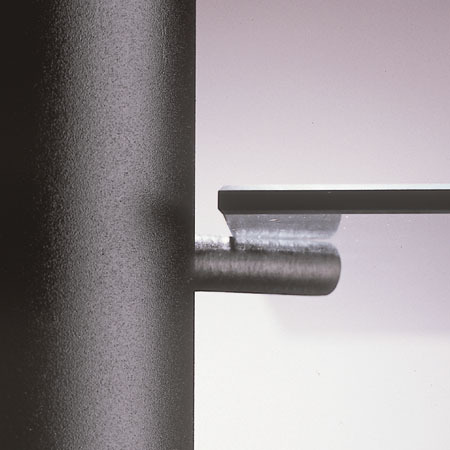 In summary, speaker stands with spikes or mastic prevent the cabinet moving relative to its surroundings and relative to the speaker cone. Spikes work well in almost all cases and are probably the best technical choice, especially for rather light weight speakers and stands. This is because the effective mass gain is a multiple of the cabinet weight. 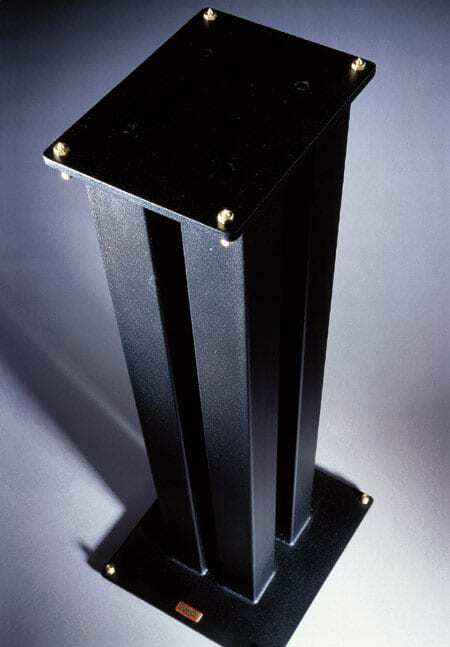 Spikes have the obvious disadvantage of marring the finish of speaker cabinets and are increasingly difficult to handle as speaker weight increases. In that case solution is to put a metal plate beneath the spike to prevent any damage. Blutac works best when used with heavier speakers. 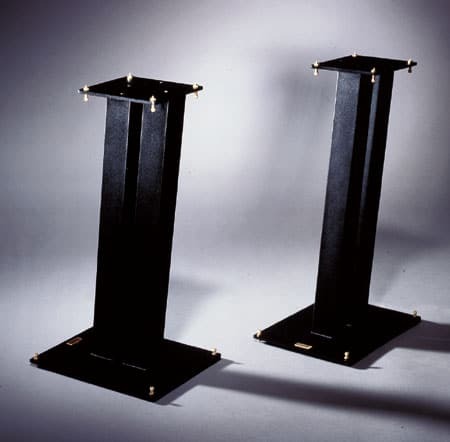 The effective mass gain is much lower, equal to the weight of the stand but is enhanced when the speaker stands are themselves spiked to the floor. 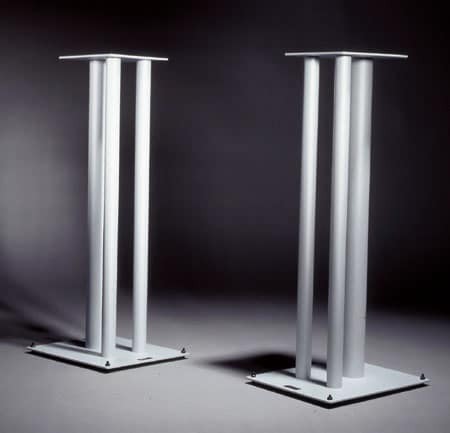 Prudently adding mass to speakers and stands will enhance the effect of both.